Well, it definitely took a lot longer than expected to get this app ready, approved and published on Amazon. But now it is time to proudly present: the Real Fakebook. All the tunes you need – in the pocket. Preloaded with chord progressions for more than a thousand classic jazz standards (perfectly legal, as it is chords only – no melodies). Import songs from other programs. Include pictures from the phone's camera. More than 1500 Spotify and YouTube links to classical recordings of the preloaded songs. Compact, only 600 kB for app and 1200 songs. Still, the Fakebook gives you all the tunes you need. In the pocket. And it even looks like The Real Thing. 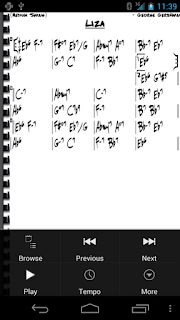 Fakebook comes preloaded with chord progressions for more than a thousand of the classic jazz standards from The Real Book ed 1,2,3,4,5... Easily add and edit your own songs or import from other formats (e.g. iReal b / iRealBook). Include your precious originals or paper-napkin fakesheets using the phone's camera, import stored photos or scans from the web. Fakebook is the ultimate tool for practicing. The app includes more than 1500 Spotify and YouTube links for the preloaded jazz standards. Add your favourite links or stored mp3 to any song. 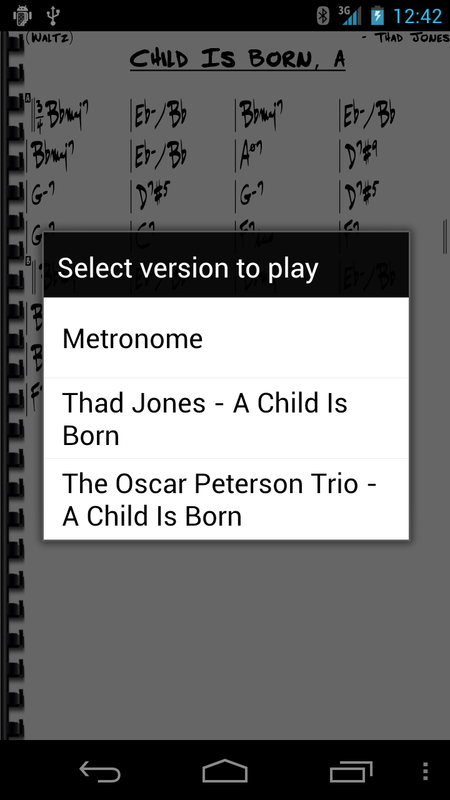 Or use the built-in metronome, which synchronizes to the tempo you choose. Chord syntax, style, font and looks like the original Real Books. Extremely compact (the app including 1200 songs is only about 600 kB). Local storage, no Internet access needed. Low requirements on resources, no strange permissions. Runs on almost all phones and pads with Andoid 1.6 or above. For each upgrade and major new feature added, the price will increase. But, of course, all this will come free for those that download now and help with input to the further development. The introductory price on Amazon will also be used on Android Market and Google Play once published there, but for a few weeks this is an exclusive Amazon app. Please note: Fakebook is completely legal as the bundled songs are chord progressions only, intended for jazz improvisation. The app does not contain any copyrighted material, such as melody lines. Skrivarna Software strongly support musicians and composers rights to get paid! Highest priority feature to add for me is the ability to transpose the changes to other keys. Global transpose (make it a Bb-book or an Eb-book) is available since a few weeks. Check the preferences menu for this. Local transpose, to adjust individual tunes e.g. a semitone down to suit a vocalist, is under test right now. Scheduled for release later this week. 1) export to jpg (i am using screenshots, and the resolution is not the best). 2) Altough it works fine in my phone, it is impossible to acess the defenitions and options on tablet, wich makes it usless for tablet use. it needs one touch screen option to open the menu, so this problem is solved. Any chance of an ios version? Yes please, for me too. Export or share with a friend. Please send me a mail and I will help you step by step. From your description I guess you just need to rename the pages. 1. i have bought and istalled Skrivarna Software on my tablet android and it seems to work fine, i made a mistake abd loaded imported some huge PDFs of scanned real book and not the software does not function well , how can i reset the softwae to its original state ? 2. The contact button in the web site does not respond nor work .